We feel it's important for children to explore nature and be outdoors regardless of the weather, so if it’s glorious sunshine or raining cats and dogs... with a sun hat on or wearing puddle suit, the fun should never end! This wonderful mud kitchen from SUN gives children the freedom to play, explore and expand their imagination. With the help of the mud kitchen children can learn to use other fun skills such as collecting, squashing, mixing, pouring, sieving, picking, smoothing, sorting, foraging and serving you some delicious mud cakes! Whether on the lawn, the patio or the decking: with this great mud kitchen, children can prepare delicious food with ingredients from the nature and be MESSY. The mud kitchen includes a storage compartment with door, a handy shelf to store all woodland finds, three holders for utensils, one metal sinks which is removable for easy cleaning, two hobs with three knobs, a removable planter on the side and three little removable boxes for storage. A unique present for boys and girls! It comes in three designs. This kitchen is pre-treated with wood protection. Risk of suffocation due to small parts that can be swallowed. The assembly and disassembly is to be carried out only by adults. Ensure correct fastening and tighten screws at regular intervals. Remove all packing materials before using the item. Delivery of the mud kitchen is without decoration. We feel it's important for children to explore nature and be outdoors regardless of the weather, so if it’s glorious sunshine or raining cats and dogs... with a sun hat on or wearing puddle suit, the fun should never end! 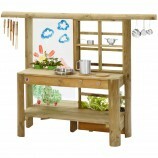 This wonderful mud kitchen from SUN gives children the freedom to play, explore and expand their imagination. With the help of the mud kitchen children can learn to use other fun skills such as collecting, squashing, mixing, pouring, sieving, picking, smoothing, sorting, foraging and serving you some delicious mud cakes! Whether on the lawn, the patio or the decking: with this great mud kitchen, children can prepare delicious food with ingredients from the nature and be MESSY. The mud kitchen includes a storage compartment with door, a handy shelf to store all woodland finds, three holders for utensils, one metal sinks which is removable for easy cleaning, two hobs with three knobs, a removable planter on the side and three little removable boxes for storage. A unique present for boys and girls! It comes in three designs. This kitchen is pre-treated with wood protection. 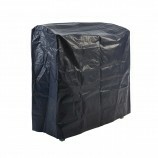 Dimensions: 102 x 40 x 105cm Material: Wood Warnings: Risk of suffocation due to small parts that can be swallowed. The assembly and disassembly is to be carried out only by adults. Ensure correct fastening and tighten screws at regular intervals. Remove all packing materials before using the item. Delivery of the mud kitchen is without decoration. Not suitable for children under 3 years of age. For home use only.